I've got to figure out how to get to the PASS Summit every year! It was AWESOME! It was great to meet more of the tweeps I follow and reconnect with those that I've met before. 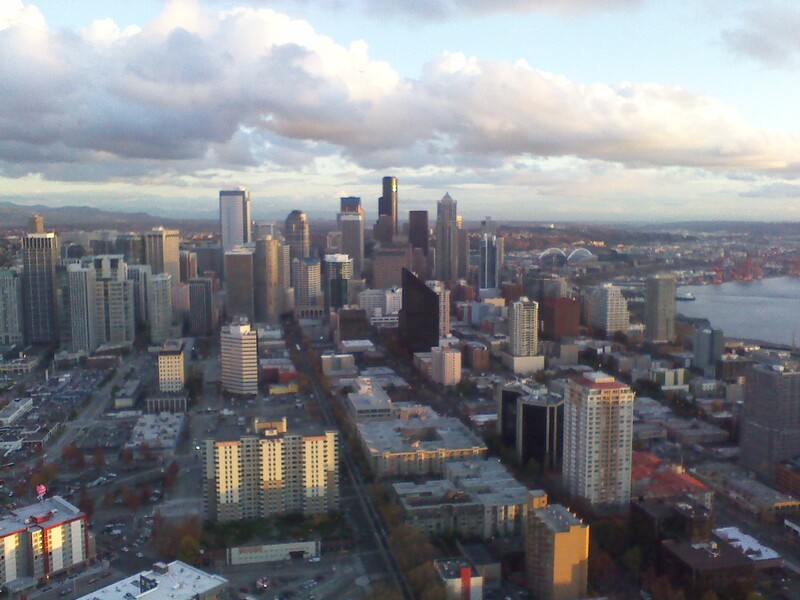 It was my first time to Seattle also. The weather was better than expected. I had a great time walking around the city when time allowed. I also had the opportunity to try the local restaurants and visit the Space Needle. Everything was great. Especially the coffee at Top Pot Doughnuts. Every time slot had several sessions I wanted to attend. You can't get to all the sessions you would like so buying the Conference DVDs is a must. Participating in my local PASS user group, SQL Saturdays, and Twitter made being a FIRST TIMER at this year's PASS Summit a non-issue. I did not feel like a FIRST TIMER. I knew a lot of people because of participating locally. I just blended right in, had fun, and learned a ton. Being a FIRST TIMER, I didn't realize I could download the slide decks before the DVDs arrive. A prompt from a co-worker made me aware of this benefit. I downloaded over a dozen decks so far and reviewed them. Great benefit. Still tons more to go through. Meeting Ola Hallengren and Paul Randal. Talking to them about Ola's Maintenance Solution was invaluable. The changes to the MCM programming have me thinking about making it a 2011 New Year's resolution. I'll have a post on that later. The Separation of Duties Framework that Lara Rubbelke and ll Sung Lee debuted has me thinking how to use it back in the real world. Any possibility of getting Youtube videos on the conference DVDs for the Top 10 highest rated sessions? Put Twitter handles on the conference badges. I've told my manager that we should be sending a representative every year. No excuses. I had a great time at my First PASS Summit! The final day of the PASS Summit started off with a great keynote speech by Dr. David DeWitt Ph.D talking about SQL Query Optimization. Dr. DeWitt is currently a technical fellow at Microsoft leading the Jim Gray Systems Lab. He said "Rocket Science is easier than query optimization." So, if you fail at query optimization, they send you to build rockets. This was one of those presentations that will need to be watched multiple times before all the non-Ph.Ds like me assimilate everything. He did a great job explaining an unbelievably complex topic in terms most people can understand. It'll just take me a few passes to totally understand. I hope. A fun interactive session with Paul Randal from SQLSkills.com with Buck Woody playing a supporting role. Buck said the interaction with Paul was not rehearsed. Too bad video doesn't make it on the conference DVDs. Joe did an excellent overview of how a DBA can use PowerShell to automate repetitive tasks. You can download the scripts from the session here. I went to this session because I need to get more comfortable with these tools. Chris did a very thorough walkthrough of how to use SQLDIAG and SQLNexus. I need to read his book next. A very well-rehearsed, entertaining and educational session. The presenters were supposedly doing tequila shots the entire 90 minutes but they were still standing at the end of the presentation so I think something else was in the bottle. My hope for this series of blog posts is to highlight just a few sessions that I found worthwhile. I think the PASS Summit conference DVDs are a compulsory purchase when attending. There are too many excellent sessions to attend in three days. I don't think you get the full value of the conference unless you buy the DVDs. Day 2 started off with Andy Warren's recommendation of Top Pot Doughnuts. I normally exercise in the morning so the walk down to Top Pot was a nice equivalent. Top Pot sits right in front of pylon 43 of the Space Needle monorail on 5th Street downtown. They have the mother of all glazed donuts and excellent coffee. Coffee so smooth I could drink it black. That's significant. I don't like black coffee. Day 2 was to be BI day for me at the PASS Summit but it quickly turned into the search for Ola Hallengren. I've read a bunch of Allen's blog posts so I wanted to see him in person. He did a broad overview of how to automate DBA tasks using PowerShell. If you're a DBA wanting to learn PowerShell, Allen should be on your list of people of blog posts to read and one of your Follows on Twitter. I did see all of this presentation and introduced myself to Allen afterwards. I wanted to see this session after hearing Amir Netz speaking during the morning keynote but I really wanted to meet Ola Hallengren at the Summit. So, I went searching for him. The power of Twitter helped me to get a description and picture of him. I sat for the beginning of this presentation but then I heard Ola was in the Experts Area in the Expo hall so I bailed out. I did find Ola in the Experts Area and we spoke for over an hour about his Maintenance Solution script. We had a great conversation and I'm all the more convinced that we need to be using his script at my employer. This session was cancelled. I'm hoping it ends up on the DVDs somehow. Another excellent day at the Summit. It was great to meet Ola Hallengren in person!